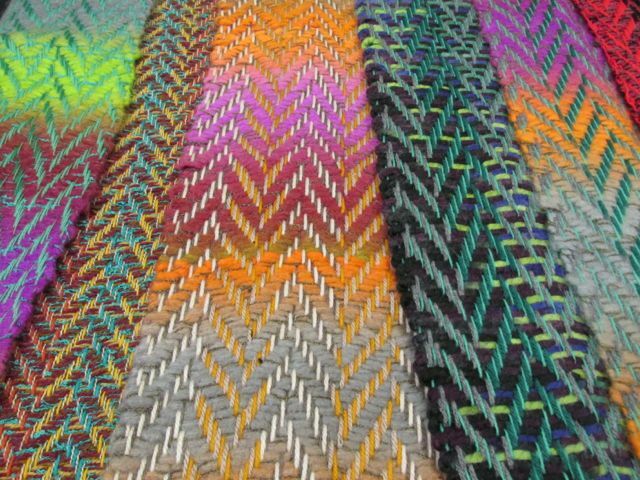 ‘Handwoven scarves by Mary Post of Harlech’ it says on the labels for Mary’s gorgeous weaving. The label really should have the word ‘beautiful’ added at the beginning. There’s quite a story behind Mary’s weaving, and it all started, essentially, on the Isle of Man where Mary and her husband had a smallholding and started raising goats, which she describes (as many goat owners do) as ‘challenging’. They ended up with about twenty-seven Angora goats which had the most beautiful coats. They weren’t quite as easy to shear as a sheep – they would reach round and bite Mary’s husband on the bum when being sheared – but the fleeces were silky and would take a dye really well. But what to do with all the fleece? There wasn’t enough for any commercial purchaser. Maybe inevitably, Mary learned to spin but she didn’t much like knitting. 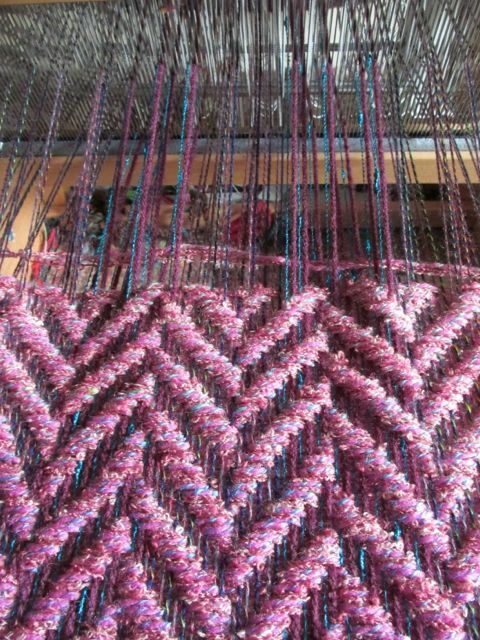 Somebody suggested that she learned to weave… and so it began. On the Isle of Man there’s an ancient right: on Tynwald Day, anyone can take their wares and sell them. At their very first attempt, they had an overwhelming response. 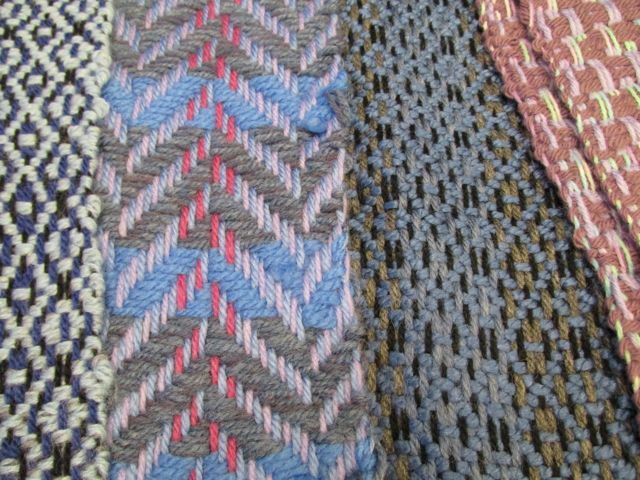 The weaving was so successful that soon Mary was spinning for up to six hours a day, and then weaving: working ‘morning, noon and night’, she says. 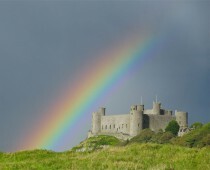 When they left the Island and came to Harlech – the goats were moved on to another Manx smallholder – Mary got her big floor loom. She’s always had several looms (‘everyone was giving me looms’ she says) and is now using a smaller, portable one most of the time which may well be on her stand at the Fibre and Fabric Fair. Spinning and weaving can be ‘hard on the body’ and Mary certainly finds the smaller looms more practical. 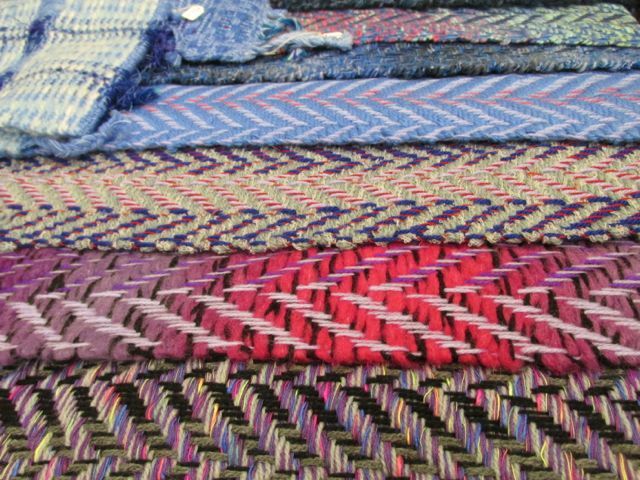 The Fibre and Fabric Fair is on Saturday and Sunday 23 and 24 July, in the Memorial Hall, Harlech, from 10.30 to 4.30 both days; it’s completely free to come in and have a go at all sorts of crafts. Oh, and there are teas and (luscious) cakes available, being sold to raise money for the Christmas lights appeal in Harlech.